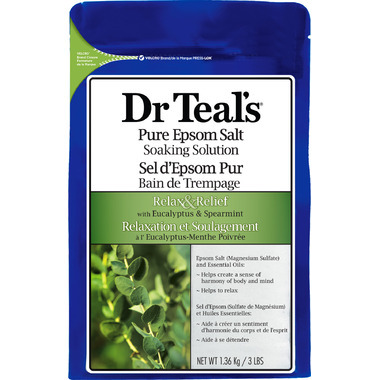 Dr Teal's Epsom Salts combine pure magnesium sulphate with luxurious essential oils to soothe the senses and ease the mind and body. Pure Epsom Salt helps to relax and find relief. Spearmint is used to energize while Eucalyptus stimulates the senses. Ingredients: Magnesium sulphate (Epsom salt), fragrance, Eucalyptus globulus leaf oil, mentha viridis leaf oil. I love this epsom bath salt so much! It is all natural (using natural essential oils) and is by far the best brand I've found for my bath time rituals. Please always keep it in stock Well! I highly recommend. Best way to decompressed after a long day! Amazing! Have used epsom salt but the combination of these two fragrances is incredible.